Supporters of California’s $15 minimum wage are now working to increase the income threshold for government services, despite their previous insistence that higher wages would save taxpayers money. 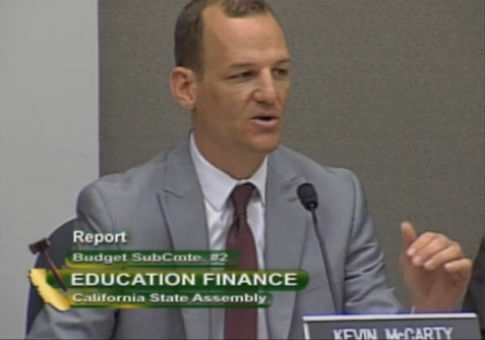 Assemblyman Kevin McCarty (D., Sacramento) told the state’s budget committee that the state should expand eligibility for government assistance programs so that minimum wage workers would not lose benefits when their wages increased to more than twice the federal minimum of $7.25 an hour. He proposed increasing eligibility for the state’s subsidized preschool program to encompass newly-minted $15 hourly earners. "The other piece which I think is really critical is expanding eligibility," McCarty said. "Some people with the minimum wage increase, they're not rich by any means, but they [now] make a little too much to become eligible for our state preschool program, so we adjust the eligibility for the first time in many years." The Service Employees International Union, a political powerhouse, spearheaded the attempt to get the $15 minimum wage on the ballot for the November election. The group and its supporters managed to clear more than 400,000 petition signatures on the ballot initiative before Democratic Gov. Jerry Brown negotiated a more gradual wage increase, which would raise the minimum to $15 an hour by 2022 with exemptions in the event of an economic downturn. McCarty publicly backed the initiative and was listed as an endorser on the websites of SEIU-United Healthcare Workers West and the Raise the Wage Sacramento. He received a $4,200 campaign contribution from SEIU after the state legislature passed the wage increase. Supporters of the bill argued that the massive minimum wage increase would help alleviate the state’s multibillion-dollar budget deficit and reduce the number of people seeking government services. According to Raise the Wage Sacramento, a $15 minimum wage would boost income for families with two workers to over $60,000 for full-time work—about $7,000 higher than the national median income for families in 2015. "Many of these [minimum wage] workers make so little they are forced to depend on Medi-Cal, food stamps, food banks, and other taxpayer-funded safety net programs just to meet basic necessities. This continuous cycle requires taxpayers to subsidize profitable corporations paying low wages," Raise the Wage Sacramento says on its website. Critics of the minimum wage accused the movement of "doublespeak." Michael Saltsman, research director for the pro-free market Employment Policies Institute, said that the move to increase income thresholds for state services reflects the hollowness of those talking points. "The argument that a higher minimum wage would save taxpayers money was always factually suspect. Now, we know that even proponents weren't taking it seriously," Salesman said. "It would be laughable if the consequences of $15—for California and elsewhere—weren't so severe." This entry was posted in Issues and tagged California, Minimum Wage. Bookmark the permalink.